Home › FAQ › What Should You Include On a College Application? What Should You Include On a College Application? Learning what to include on a college application is one of the most important steps that students can take before applying to college. 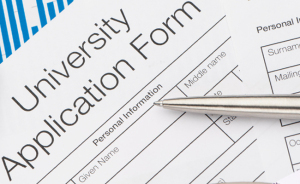 Making even one minor mistake can leave your application sitting on the bottom of the stack or going in the trash can before it reaches the admissions board. In addition to checking your application for grammar and spelling mistakes and ensuring that you filled out all areas completely, you can also find out what information you need to include. One of the things that colleges look at when selecting new students are the grades those students received. Read the application carefully to determine if you need to submit a transcript that shows your grades and the classes you took or if you can simply submit proof of your grade point average. Many states now let high school students take college classes and earn both high school and college credit at the same time. If you took even one college level summer class, you need to include a transcript from that college. You typically need to take one of two large examinations before applying for college. Most schools let you take the SAT or the ACT, but some schools will now only accept the ACT. When you take that test, you can request that the testing board automatically send your scores to one or more schools. Many students request that the board send their scores directly to their homes first. This lets you see how well you scored in comparison to other students and decide if you want to submit your scores or take the test again to improve your scores. When looking at what to include on a college application, you’ll likely find that colleges want at least one letter of recommendation from someone familiar with your work in high school and your personality. Many colleges today let you submit at least one letter from a peer, which can be from a close friend or one of your classmates. Schools also request that you submit one or more letters from someone with knowledge of your work in the classroom. This gives the college a better look at you as a person and a better understanding of what you can do. Your personal statement is another thing you’ll find when you research what to include on a college application. Also known as an essay, this portion of the application gives you the chance to shine. Courtney Rubin from US News and World Report, asked a series of admissions board members for tips, and she found that they encourage writers to introduce something new and not repeat themselves. Use your statement to show why you’re the best person to fill a spot at the college. Avoid writing about your pets, your grandparents and other topics that the board saw hundreds of time. Use your personal statement or essay as a way to showcase your talents and experience. Even if you have high test scores, good grades and dozens of extracurricular activities, you might still not get into the college of your dreams. Those schools place a high level of importance on your completed application packet. Knowing what to include on a college application is one of the best ways to ensure you fill it out correctly and include everything the admission board wants to see.